In order to build trust, we need to show vulnerability, we need to have trying experiences together, and maybe even get into trouble together (that is what my dad says about why my brother is still close to his high school friends). Vulnerability, however is hard to produce in a work environment without a real moment that causes it. We are taught that emotions are not supposed to be in the workplace, but let’s face it, we’re emotional people. We work for huge parts of our day and sometimes see our co-workers more than our families. So doesn’t that mean we should have plenty of opportunities to build trust? Most of the time new teams, or even teams that have been together for a long time, that trust can be really hard to build or regain if lost. 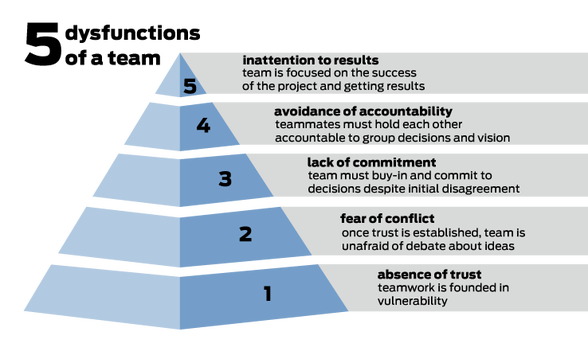 We have all heard of Patrick Lencioni’s 5 Dysfunctions of a team and Tuckman’s Team and Group Development Model (and if you haven’t, here they are). 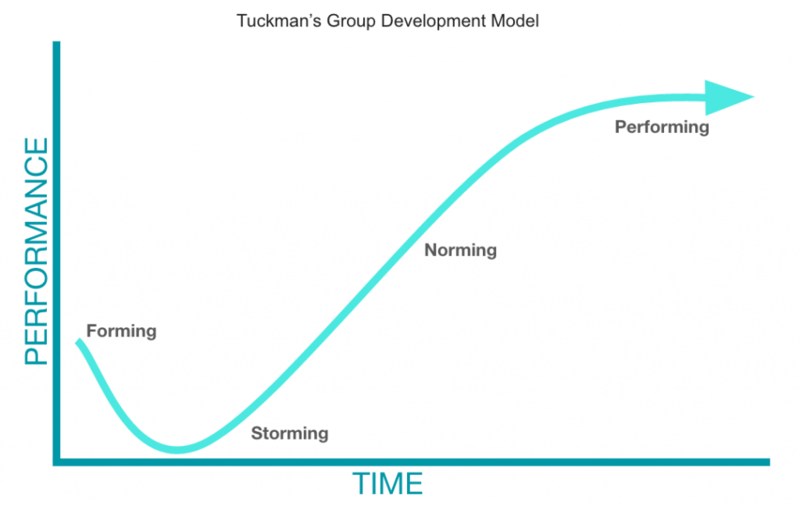 Teams need to have trust, but to get to trust, they need to get through Tuckman’s model. Starting out in forming, teams have nothing in common, not much history, and are often on their best behavior. It’s often when they move into storming that the issues start (hence the name), but storming is a vital stage in building trust. What is one emotional trigger you have at work? How do you react when you are triggered? Why you think it’s a trigger? It seems simple but it isn’t. It actually extremely awkward to talk about a trigger and reaction with other people. It’s vulnerable. We’ve all had the interview question about our weaknesses and we’ve all tried to make them look better. But a trigger? This is about being real, helping others to understand what we’re like at our worst, and explaining why (often an emotional issue) it happens from the root or source. Here’s an example of mine. An emotional trigger I have at work is when people misspell things in emails or have poor grammar because they are being sloppy or lazy. I react by being passive aggressive, making faces or comments (almost involuntarily as I do in many other situations) when I read it, and by looking at that person in a worse light. Unprofessional writing is a trigger for me because when I was a child I struggled to keep up in reading and was put in a special class for a few months. It was difficult to be below average in the age of millennial children being told we were all the smartest. Even though I got past that in elementary school, I had a similar experience with a graduate school professor criticizing my writing and passive voice on my thesis. I truly went back to that childlike state of feeling unintelligent and like I could not do anything right. This is why I trigger hard on people not taking the time to re-read their emails and making small errors because I have had to try so hard to overcome it. “Most of us assume that you have to build trust in order to be vulnerable. But actually, the opposite is true. Part two of the activity follows with a set of more questions and action planning to hold ourselves and others accountable for our triggers. It’s another round of vulnerability that can help to bring the group together. How will you remain self-aware of this trigger? This allows the group to co-create action plans and establish more vulnerability while giving permission and trusting others to help. It also establishes a feeling of ownership which is important. If you own that you have the right to something and have control over it, it feels less shameful. To own something is to take the power away from it and you do that by understanding how it influences you and remaining self-aware (with others helping, too). This begins the process into team norming and even performing.